Rare has officially released the Forsaken Shores update for Sea Of Thieves and it looks every bit of hellish as the name suggests it to be. This time around you’ll be dealing with many more hazards such as earthquakes, volcanoes, undead that just don’t seem to be killed, and a lot more treasure to try and snag. You can read the official description for the update below, along with a hilarious Sea Of Thieves trailer with Matt Berry that basically shows him not giving a damn whether your character lives or dies. Forsaken Shores officially invites players do the Devil’s Roar, and all-new region to explore. This perilous and challenging area of the Sea of Thieves will have players encountering volcano eruptions raining down hot rocks and flowing lava, terrifying earthquakes, unpredictable geysers that can fling players into the air and dangerous super-heated water around islands. Also new to Forsaken Shores is the Row Boat, which will be key to assisting the navigation of this dangerous new region, but also enriching all journeys across every area of the world. Pirates can experience this content and more as part of a four-week campaign to uncover the secrets of the first crew to venture into the Devil’s Roar. 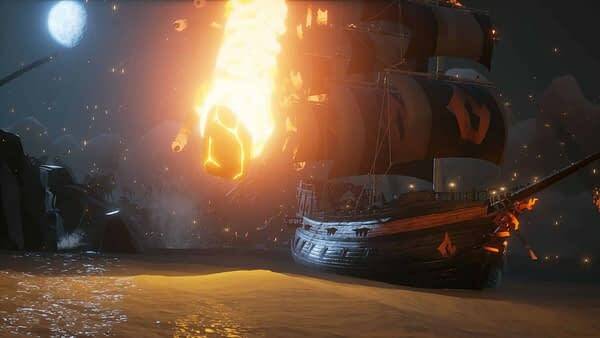 Sea of Thieves Will Be Getting Competitive with "The Arena"
Sea Of Thieves Reveals Two New Events in "Cursed Sails" and "Forsaken Shores"